I have been waiting for months for "Blue Valentine" to come out on DVD. I had visions of me watching the world's greatest love bloom, and then sobbing when it inevitably fell to pieces. This movie was awful. It's sad, but not in a way that will afford you a good cry with a bottle glass of wine. It's more like watching intraveinous drug use or a gangbang on "The Wire". It just made me feel dirty. The most frustrating part of this movie to me was that there was absolutely no point to it. I didn't learn a lesson about love or making a relationship work. I pretty much just learned that if your dad is verbally abusive and you yourself are a monster slutbag, than life isn't going to be that grand. 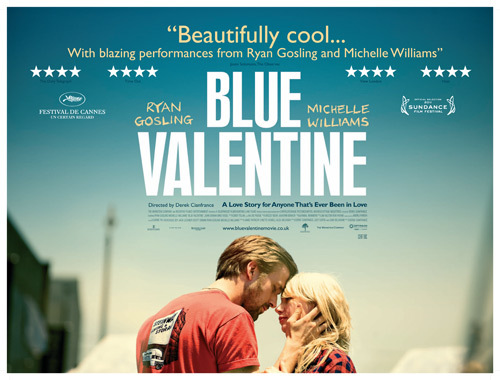 So in case you didn't already know that, save 2 hours of your life watching Blue Valentine and just trust me. It's true. Damn. I was really looking fwd to this one.